During the Second World War, the U.S. State Department was notorious for its role in impeding the immigration of refugees, particularly Jews. Reflecting fears about German spies, the Department issued a so-called “relatives rule,” which instructed U.S. consuls abroad to deny visas to any applicant with close relatives in Nazi-occupied territory. Breckinridge Long, the State Department official who supervised the Visa Division, was notorious for his work to prevent emigration to the United States. Long even went so far as to write a memo in 1940, outlining how the State Department could block all immigration if necessary. Few at the State Department did more than Long to prevent emigration of refugees. Long pressured Roosevelt to curtail the list of political refugees: that is, at-risk religious and intellectual figures who would have an easier time emigrating. Long also temporarily blocked news of Nazi mass murder from reaching the United States, for which the Treasury Department reported him to Roosevelt. When legislation appeared in Congress to urge creation of a separate commission for Europe’s Jews, Long gave false testimony and exaggerated the number of refugees admitted by the State Department. Long pressured Roosevelt to curtail the list of political refugees: that is, at-risk religious and intellectual figures who would have an easier time emigrating. 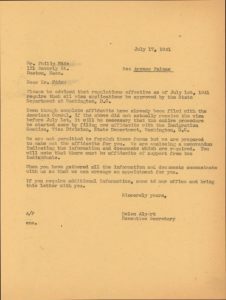 One document I’ve seen multiple times in the Boston Hebrew Immigrant Aid Society case files, and a byproduct of the State Department, is a notice from July 1941. The notice advises the recipient that the State Department will now be handling visa applications. The letter spells out the consequences of this: “it will be necessary that the entire procedure be started anew by filing new affidavits.” Just like that, people were back to square one with their immigration cases. U.S. consulates were shut down in Nazi-occupied territory that same month, and the number of financial affidavits needed to emigrate was doubled. Visa applications now appeared before a government panel that included representatives from numerous military and security departments. For those who filed new affidavits, the odds of approval were low. 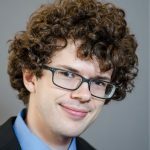 The State Department’s Interdepartmental Visa Review Committee was not required to provide reasons for denying visas, and agencies like HIAS Boston could often only speculate on why a visa had been denied. Consulates also had wide authority to deny visas. Secretary of State Cordell Hull advised consulates to take great caution in granting visas, and to err on the side of refusing them. In one case, a person with an affidavit from one of Boston’s wealthiest individuals was informed that their financial records were insufficient. Some people were put on a waiting list before the war, endured and survived the war, and then discovered afterward that their number still hadn’t been called. Many people didn’t get that far in the immigration process. In 1938, under the quota system, the waiting list for Germans emigrating to the United States was more than ten years long. One of the few things more disheartening than the 1941 visa notices are case files where people were put on waiting lists. Some people were put on a waiting list before the war, endured and survived the war, and then discovered afterward that their number still hadn’t been called. The German quota was filled in 1939 and almost filled in 1940, but increasingly strict immigration policies from the State Department led to a drop in visas issued, in spite of an enormous amount of applicants. 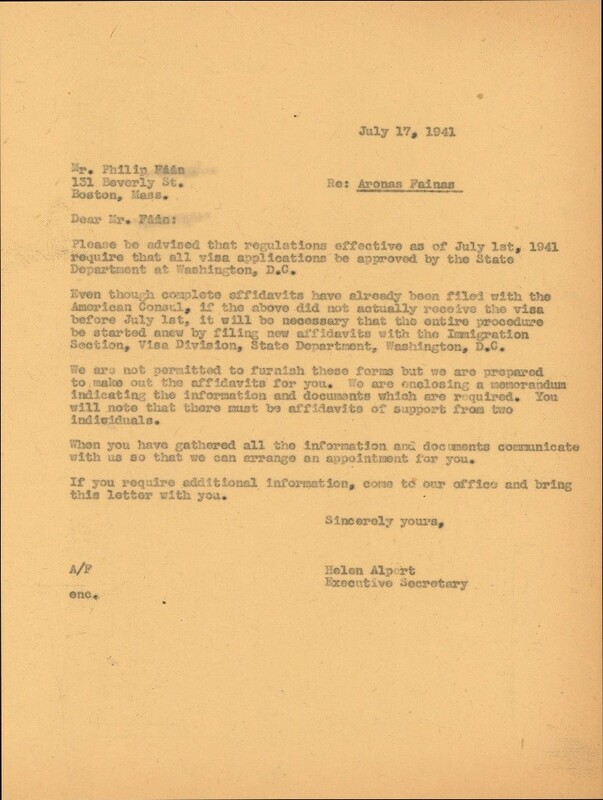 Working with the Boston HIAS case files over this past year has taught me a lot about the different obstacles and problems Jewish refugees faced, and the blatant government obstructions aiming at hindering their emigration. Simultaneously, I have also gotten to learn about the efforts of an organization and its partners to overcome those obstacles. Many cases don’t have a clear ending, but it’s heartening to know that for all the efforts to close the gate to Jewish refugees during World War II, there were groups that worked to hold it open. Information from the Boston Hebrew Immigrant Aid Society case files, and the United States Holocaust Memorial Museum.